When locating the best fit for your loved one in an assisted living community, ask a variety of questions at each community you consider. Questions and concerns, dietary provisions, staffing, cleanliness, and the activities calendar are appropriate to examine before deciding on the most suitable assisted living community. Some less obvious, but important questions have to do with procedures the community has in place should disaster strike. What are the emergency procedures in place if fire, flood, or other natural disasters such as tornadoes suddenly strike? These may not be at the top of your list of questions to ask a potential assisted living community, but they definitely should be on the list! In fact, tornadoes, nature’s most violent storms, occur in the greater Tulsa area, so preparation for your loved one’s safety is imperative. Executing safety precautions during a tornado warning creates the best possible outcomes for all who take them. As you know, a tornado warning indicates a tornado has been spotted or seen on radar. And it requires action to help keep you safe. Go to an interior room without windows on the lowest level of the building, such as a restroom. The more walls there are between you and the outdoors, the better. Keep your shoes on and cover up with a coat, blanket, or pillow. It’s also wise to cover your head in some way. Avoid windows, and don’t take shelter in a hallway that opens to the outdoors. If you are in a vehicle, pull over and exit it immediately, and take shelter in the lowest floor of a sturdy, nearby building. 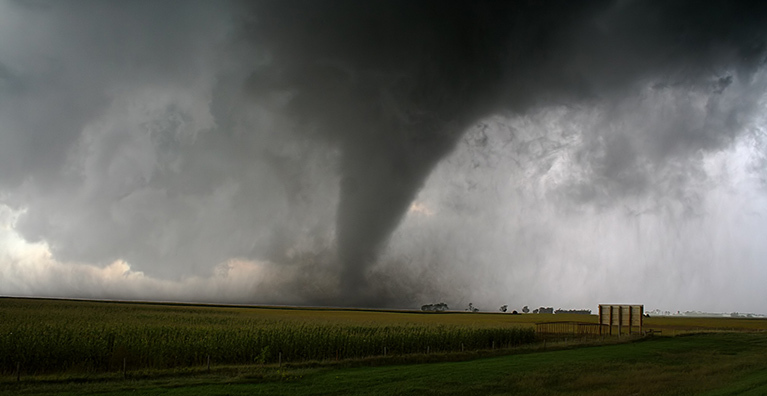 If a building is not in sight, don’t try to outrun the tornado. Instead, lie flat in the lowest elevation you can spot quickly, and cover your head with your hands. Don’t take shelter under an overpass or bridge, where you could be exposed to flying debris. It’s one thing to prepare yourself or your family for the possibility of natural disasters; it’s another thing to prepare a whole community for a fire, flood, or tornado. When asking potential assisted living communities about their emergency preparedness plan, be specific and thorough—it’s your loved one they will care for, and their safety is vital. What are your protocols for various emergency situations and natural disasters such as tornado, fire, and flood? Is the facility able to run if there is a power outage? Do you have enough trained staff to evacuate residents if necessary for safety? What is the emergency evacuation plan? Are employees trained in emergency procedures? Are emergency drills conducted to prepare for natural disasters? What is the plan for sheltering in-house? Are you adequately staffed to implement emergency plans? How frequently is your staff trained in emergency procedures, and what type of training do they undergo? How often does your staff practice the procedures? How do families get into contact with you for updates on emergency situations? Are updates posted on a website or by other electronic means? How does the emergency plan coordinate with state emergency management? What is the family’s role in an emergency? Are there specific ways the family can help in an emergency? How will you keep the family updated in an emergency? If the phone lines are down due to natural disaster, is there another number families can call for updates on loved ones? How do you prepare residents for natural disasters? How are residents identified during an evacuation? Does each resident have a wristband in place? How are residents tracked at a new destination in case of evacuation? How are medical records kept safe and transported during natural disaster? How are records recovered that were damaged by fire, flood, tornado, or other natural disaster? The level of preparation for an emergency can be a matter of life and death if disaster strikes. Verify the details of the emergency preparedness plan for your loved one’s assisted living community to ensure their safety at all times. The Parke Assisted Living Community invites you to discover the quality of life available for your loved ones. Check out our services and amenities page to learn about the diverse opportunities we offer residents. Our 24-hour staff takes care of emergency preparation, pharmacy services, housekeeping, monthly wellness clinics, meals, activities, and entertainment. We look forward to meeting you and your family and discussing the best possible solutions for your loved one. When your family member is ready for senior assisted living arrangements that provide socialization, as-needed care, independence, and enriching activities, our elegant, state licensed, Tulsa area assisted living community, The Parke Assisted Living, is honored to provide for your needs. Call us today at 918-249-1262 to schedule a tour and complimentary meal.